This lunchbox-friendly salad is quick and easy to make - a great standby. The touch of cumin adds warmth and why not try it with fresh chilli? 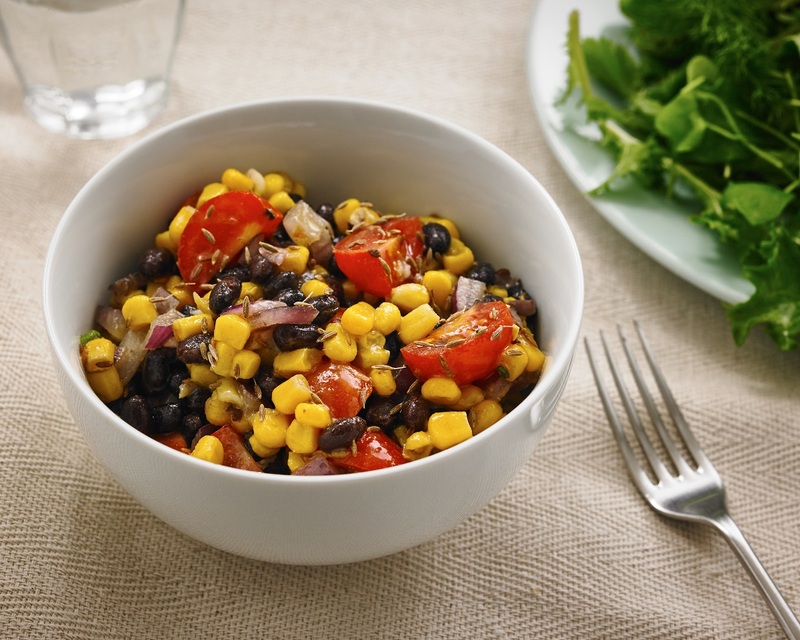 1: Pour black beans, tomatoes and corn into a colander. Rinse, and drain. 2: Cut the potatoes into cubes. Parboil in pan of boiling water for 5 minutes. 3: Drain water from the potatoes and place on a baking tray. Brush lightly with olive oil and garnish with fresh rosemary and black pepper if you have any. 4: Roast in the oven on 200C/400F/Gas Mark 6 for 8 minutes or until golden brown. 5: Once the potatoes have cooled add to a large bowl or pan, add the black beans, tomatoes and corn and mix together with olive oil. 6: Squeeze the juice of one lemon or lime on top.